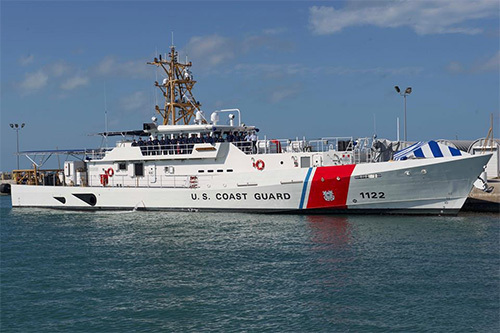 (SitNews) Ketchikan, Alaska - This summer a major change is taking place at the Ketchikan Coast Guard base as two new 154-foot fast response Coast Guard cutters join the Alaskan fleet. 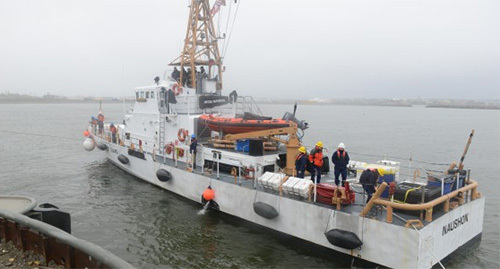 The John McCormick and the Bailey Barco are two of a new generation of U.S. Coast Guard cutters that are replacing the 110-foot cutters, some of which - like the Ketchikan based Naushon - have been on their posts for more than 30 years. The cutter Bailey Barco, the 22nd 154-foot Fast Response Cutter in the Coast Guard fleet, will be homeported in Ketchikan. Commissioning is scheduled in June 2017. The U.S. Coast Guard has a long history in the Ketchikan area, going back to the earliest part of the 20th Century, when the U.S. Lighthouse Service arrived in the region to make it safer for the increasing numbers of ships sailing up the coast. As more and more ship traffic began heading north to Alaska in the 1880s and 1890s, more and more of those vessels began running aground. That's what brought the U.S. Coast Guard to Southern Southeast Alaska, more or less. 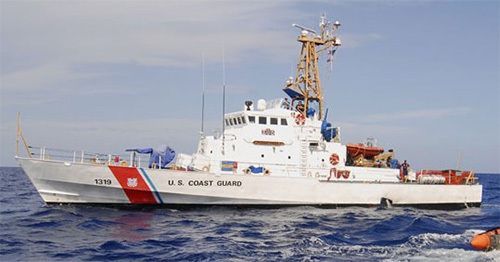 The USCG was preceded in this area by the U.S. Light House Service. For several decades after the purchase of Alaska in 1867, there was concern about the need for aides to navigation along the coast of the territory. Companies such as Pacific Coast Steamship even offered to transport buoys north to mark shoals and other hazards. The Federal Lighthouse board recommended lighthouses in the area but Congress declined to provide funding. In 1892, the Lighthouse board specifically recommended a lighthouse at Mary Island, approximately 30 miles south of Ketchikan and the customs entry point for ships coming up the coast from Canada. But Congress continued to hedge. Finally in 1895, the U.S. Lighthouse Service, which would eventually merge with the Coast Guard, began to plan for a series of lighthouses in Southeast Alaska. As usual, methodical government planning was then upset by historical events. The John McCormick, the 21st 154-foot Fast Response Cutter in the Coast Guard fleet, and one of two to be homeported in Ketchikan. Photo of its arrival in Ketchikan in March 2017. In this case, it was the Klondike Gold Rush of 1897 which brought tens of thousands of hopeful prospectors north to Alaska, the majority on boats through the Inside Passage to Skagway. Since anything that could float was pressed into service for the sea voyage from Seattle, it is not a surprise that many of the vessels had trouble reaching their destination. It has been estimated that more than 1,000 travelers died along the Inside Passage in three years as many of the ships ran aground or foundered on the unmarked hazards of the area. That carnage finally spurred Congress to provide money to begin building lighthouses in Southeast Alaska. The first two lights, Five Fingers and Sentinel Island, became operational near Juneau in 1902. Mary Island's long sought light first beamed in 1903. Tree Point and Guard Island began operation in 1904. Numerous other lights were also commissioned up and down the Alaskan coast. In 1910, the Lighthouse Service was reorganized and the 10th District was created specifically for Alaska, In 1911, Ketchikan was selected as the District Headquarters and a wharf was erected near the current site of Talbot's in Ketchikan's Newtown area. The Lighthouse Service building was prominent in early Newtown photos, owing to the distinctive multiple small dormers on its roof. Initially, the steam tenders Columbine, America and Kikui were homeported in Ketchikan to service the lighthouses, buoys and other navigational aides. In 1918, U.S. Secretary of Commerce W.C. Redfield visited Ketchikan to study Lighthouse Service facilities. It was determined that a new facility was needed, a little outside of Ketchikan' increasingly congested core. Congress appropriated $90,000 and construction beganlater that year on the buildings that are now at the current Coast Guard base, south of downtown Ketchikan. In 1920, the service occupied the two-story administration building. The facility included buoy shed, blacksmith shop, marine way and wharf. The first Coast Guard cutters assigned to the base, the Smith and the Cygan, arrived in 1923. In 1927, the marine railway for lifting boats from the water for maintenance was built. About that same time, the Guard Island Light station was rebuilt because of storm damage. In 1937, a fire destroyed a third of the Ketchikan dock and Mary Island light was reconstructed. "Ignore Blizzard -- Return To Ship" USCG, July 1951 -July 1954 by SID MORRIS (SitNews. February 2003) Rescue story the recent movie "The Finest Hours" is based on. To help crew the decommissioned Acushnet, click here to donate to the gofundme account. Two years later, President Franklin Roosevelt merged the Lighthouse Service with the Coast Guard. The Juneau USCG office was opened. At the time, 970 aids to navigation and 15 lighthouses existed in the region. 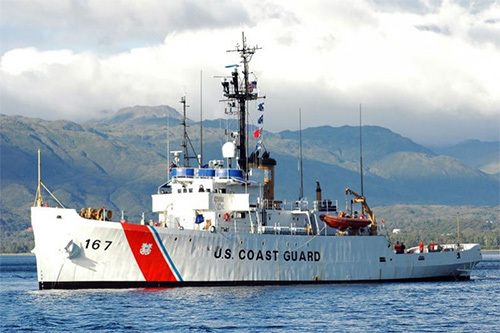 Three lighthouse tenders and two Coast Guard cutters were based in Ketchikan. Wartime construction greatly changed the base. Added were four warehouses, a mess hall, a 320-man barrack, a 416-man barrack, magazines, an armory, electronics shop, officer quonset huts, post office and chapels. The Coast Guard radio station at Point Higgins and the Annette Island air station were opened. At its peak, the wartime facilities had more than 500 personnel. In 1942, the CGC McLane was credited with destroying a Japanese submarine near Cape Decision. The sinking was never officially confirmed by the Japanese. After the war, things quieted down but the base continued to expand. The district supply depot was opened in 1950 . Homeport: Aberdeen, Washington at the time of this photo; moved to Brownsville, Texas in 1962. "; photo is dated 24 April 1962; photographer unknown. In the early 1960s, several of the wartime buildings on the upper part of the base were demolished. 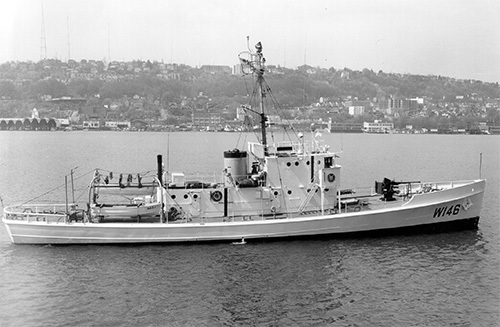 In 1960, the 95 foot cutter Cape Romain was stationed in Ketchikan and would remain in Ketchikan until 1986. It would be replaced by the 110-foot cutter Naushon which would remain in Ketchikan until 2017. By the late ‘60s the automation of the lighthouses had begun. In 1969, Guard Island, Mary Island, Lincoln Rock and Tree Point were automated. In 1970, the supply depot was deactivated. But growth would take place in the 1970s. The Marine Safety Detachment was established in 1975 and the Juneau group was deactivated, placing the still manned Five Finger Light and the tender Elderberry in Group Ketchikan. In 1977, the Annette Air Station was closed and its operations would move Sitka. That same year the Point Higgins radio station operations were transferred to Kodiak. In 1982, the Loran Station at Shoal Cove and the cutter Cape Hatteras became part of Group Ketchikan. 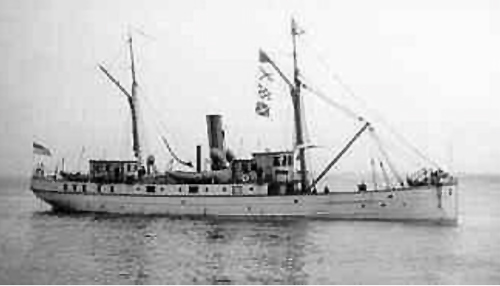 Later the buoy tender Laurel was transferred to California. In the 1990s, the 213-foot, World War II era, cutter Achushet was scheduled to be retired, but US Senator Ted Stevens had it transferred instead to Ketchikan where it would remain until 2011. The 175-foot buoy tender Anthony J. Petit was homeported in Ketchikan in 2000. By 2009, the US Coast Guard was the large employer in Ketchikan with more than 300 employees, but that number dropped back a bit when the Acushnet was retired and the Shoal Cove Loran Station was closed. After the Acushnet was retired in 2011, efforts began in Ketchikan to replace it and the aging cutter Naushon. Significant effort also went into improving the aging infrastructure at the Ketchikan base. Initially, in 2012, a second 110-foot cutter, the Chandaleur, was homeported in Ketchikan to assume some of the Acushet's regional patrol duties. The Chandaleur and the Naushon remained at the Ketchikan base until 2017, when a new class of 154 fast response cutters began replacing the 110-foot Cape class ships. The John McCormack and the Bailey Barco arrived in Ketchikan in the spring of 2017. 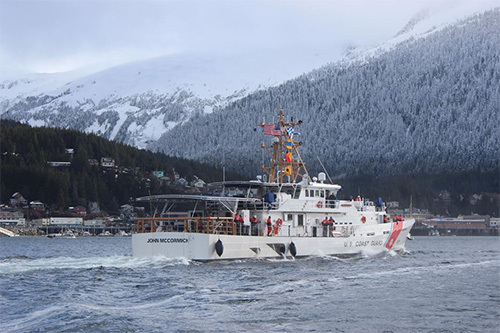 In 2017, the USCG remains one of the largest employers in Ketchikan with more than 225 staff and employees, in addition to numerous dependents that live in the community. Ketchikan has also remained a popular retirement community for dozens of "Coasties" after their tours have ended.